For some reason, there was no announcement on ACOT's Facebook page this week about the sketch challenge, so I copied it from the message boards so you all could see the sketch I was working from. I was on a roll, completely 3 layouts in about 4 days a couple of weeks ago. I was recovering from a head cold and feeling great only to have a second head cold hit me that week. In addition to that, I've had a much busier schedule than normal, but boy did it feel good to get a layout made!! To me, this layout turned out very minimally like the sketch, which is unusual for me. I try and stick to a sketch as much as I can, but this layout just went it's own direction. I kept it pretty minimal because I really didn't have a lot to say. I like to snap pictures of hands and feet when my kids are really little. There is just something to be said for how amazing it is to know that these features all exist because I grew them. These photos are of my youngest from last year, 6 days before he turned 1 month old. 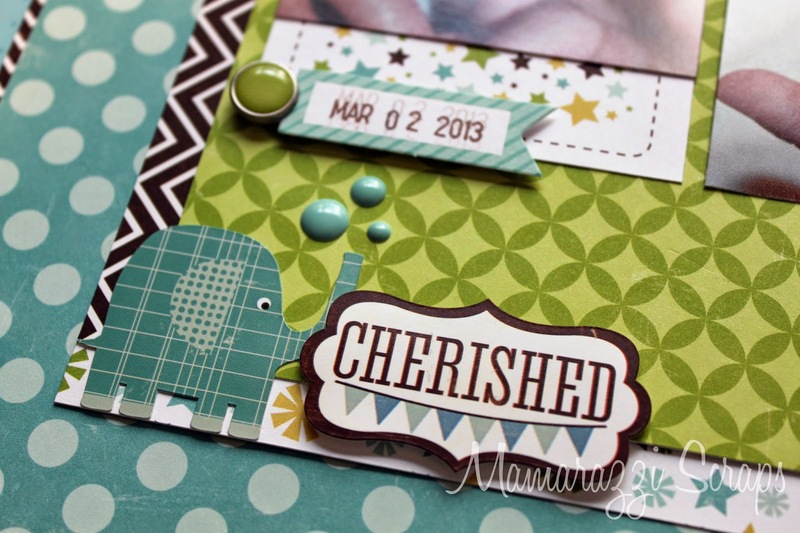 This entire layout is using Echo Park's Bundle Of Joy Boy collection which the exception of an October Afternoon Date Stamp, Doodlebug Enamel Dots, Momento Rich Cocoa Ink, and an American Crafts Brown Precision Pen in .03. I've noticed that my current 'thing' is to mat my background paper onto another paper. I'm really loving how that looks and this layout is no exception. I had no intention of matting the photo block, but decided to do so after adding that star paper under the photo of my son's face. I realized at that point that there wasn't a lot of other white and that paper really popped out and while I liked it, without balancing it with some more white, it took attention away from my photos. 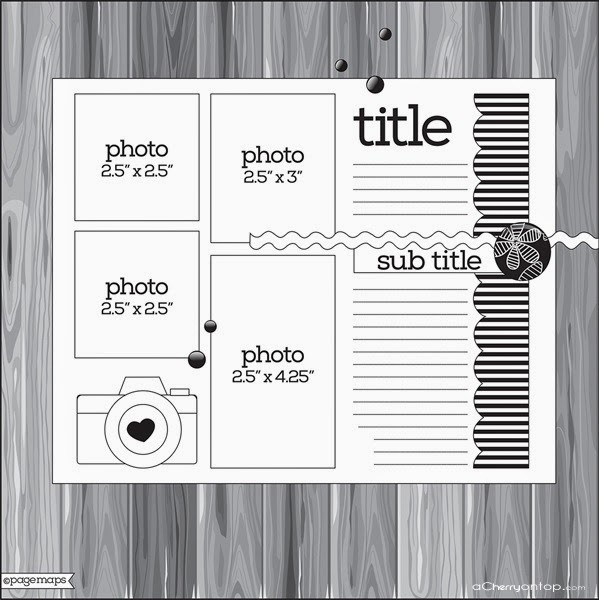 There is a full mat of the white star paper behind the photo, but I didn't like how it looked so I took a couple of strips of the brown chevron paper that also framed the background and added them to either side and I really like the look of it. Peanut has been Parker's nickname since I was pregnant. It was an evolution from 'P' as we didn't want to give away his name (we don't announce names until after birth) and it stuck. As a result, I love all things elephant and just had to use them here. I like that the enamel dots almost look like bubbles, too. The date banner above is two different pieces from the coordinating brad package for the collection. I took the brad out that went with the banner and chose a green chevron one instead. The brad does not go through the paper and is instead folded to one side and held into place by a Stampin' Up Dimensional. I also used a few Dimensionals to to prop up the 'Cherished' sticker. I added this as a space filler after deciding that journaling just wasn't necessary for this layout. While there is still quite a bit of dead space in the bottom, I felt as though this element was enough to make it look intentional rather than just not knowing what to fill the space with. The other stickers were either too big, the wrong color, or were religious in nature and therefore not applicable. 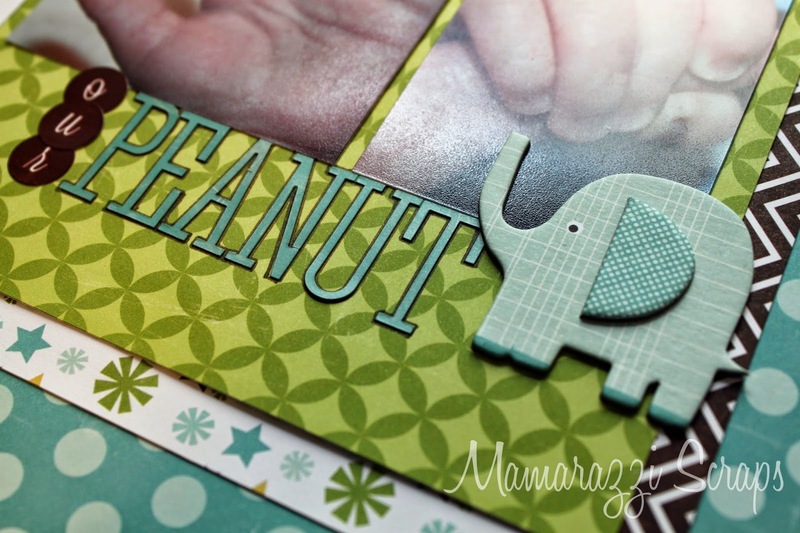 I wasn't sure how I would feel about outlining the word 'Peanut' in the title, but it really made all the difference. At first, I tried a Z on a scrap piece of paper using a Stampin' Up Early Espresso Marker but it was just not fine enough. I ended up using a .03 brown Precision Pen from American Crafts instead. I probably would have gone with a .01 pen if I had one. If I could get a blown up version of this elephant put it on the walls of my boys' room, I probably would. Isn't he just the cutest?